I have been using fountain pens for drawing since I can remember. I have been using fountain pens for drawing since I can remember. We have been using them in Poland for writing in primary school (your letters were supposed to look better when written this way) so, naturally, I used them for drawing too. 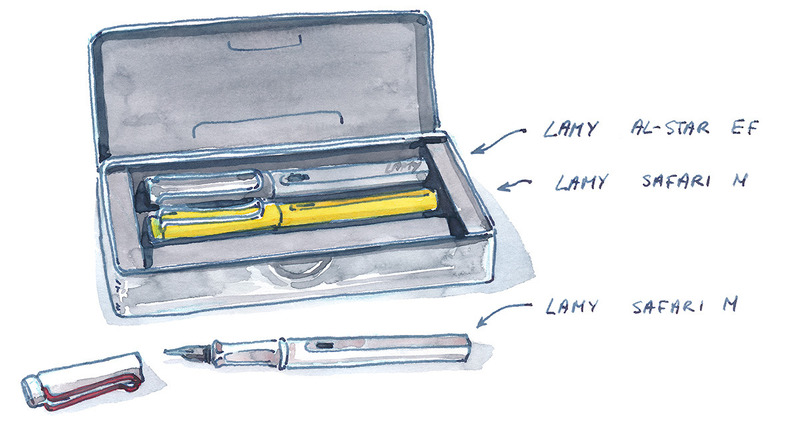 LAMY Safari with the M nib and a LAMY AL-star with the finest EF nib for writing and sketching. I generally avoid ballpoint pens (even the better ones) mostly because I don’t feel they are reliable enough. I feel that the line they produce lack in the stability and repeatability the pens I mentioned above provide. I know that some artists use them for sketching and even final illustrations (like for example Fran Meneses ) but they are not for me. On the other hand, I would really like to use the nib pens that comic artists in Japan prefer but because of the sharp nib tip, they are not well suited for watercolor paper. So a no-go for me. most good fountain pens are quite sturdy and last a long time. With more popular brands you can replace nibs if you damage them or want to get different with of lines. Being able to use color waterproof inks is a big deal for me - I’m drawing most lines for my current illustrations with waterproof blue ink and painting over them with watercolors! With multiliners, I’m mostly stuck with black and rapidograph pens don’t give me such line variability. I’m currently using the SAILOR seiboku and souboku blue inks which are waterproof and pigment based for my line work. Also, the ink flow with fountain pens is generally better than with multiliners - the ink does not have to go through the felt-like tip so even with faster, energetic lines you can get good nice, stable lines. If you have not tried yet writing or drawing with a fountain pen, I deeply recommend you trying them out. If you don’t know what to buy, try some at your local store or buy the ones I use - LAMY Safari (or cheaper Pilot KAKUNO). Also, remember that the paper that you use for writing and drawing is really important when you use a fountain pen - not all papers can handle the wet ink. For writing, the MD notebooks made by MIDORI company are a good example of well-suited paper. Also - there are some fountain-like pens made for drawing (manga pens with fountain pen nibs). I tried out some of them and (in my opinion) just a good fountain pen is a better solution. This article was first published HERE on 24 October 2018.